In a early moment of Crystal Dynamics’ reboot of Tomb Raider, neophyte Lara Croft is, for all intents and purposes, about to be raped. She fends off her attacker, grabs his fallen gun and proceeds to put a bullet in the scumbag’s head. 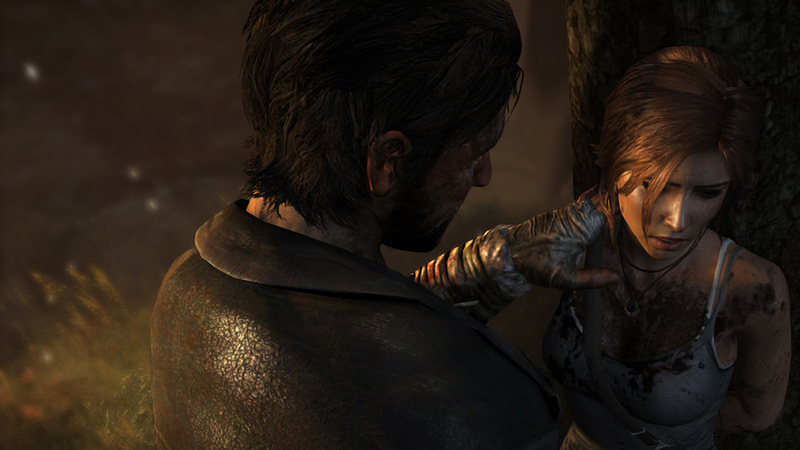 Lara’s reaction to seeing the dead body, made by the gun in her hand, is to wretch and weep. She gasps for air as she stifles her panic. Her physical reaction is palpable and realistic. This is her first kill; a life snuffed out by her hands. It weighs on her in that moment and also on the player. After taking a moment to collect herself, she rises with a new purpose. The purpose is simple and serves as the character’s narrative thrust that propels her through the rest of the game’s story. Survival. Immediately after having this very visceral reaction to the death of her attacker Lara proceeds to kill, and kill and kill again. Much has been made since the game’s release about a perceived disconnect between Lara’s reaction to killing her attacker and the gameplay which often has you killing enemies, either by stealth or full on assault. The general criticism is that she adjusts to killing too soon after being so visibly shaken by the reality of what she has done. Taken purely on a gameplay level, this would be true, but what these criticisms are missing, is that she killed her attacker to survive. It was a clear case of him or her and she did what anyone that wants to survive would do. From that moment on she knows these men want to kill her. What does she have to do to survive? She has to kill. Her attackers are constantly the aggressors, either by shooting, stabbing, or even throwing dynamite. They are relentless in their desire to kill her and she is absolutely unyielding in her desire to make it out alive, find her friends, and escape. The disconnect between character actions and the story the game wants to tell is hardly a new concept. Plenty of games have asked the player to hold up our disbelief like Atlas. The recent Far Cry 3 has a similar set up to the one in Tomb Raider, in which Jason Brody, the character the player’s control, reacts to killing someone for the first time in a very visceral way. He then proceeds to learn how to hunt, and kill with the proficiency of a Special Forces soldier dropped in the middle of a deadly jungle with insurgents and wildlife that were bred to kill. The problem is, the game makes it a point to tell you that the lead character, Jason, has never fired a gun prior to killing that first man. By the end of the game you, as Jason, have probably killed upwards of 500 people and Jason expresses his delight in doing so. In Grand Theft Auto IV, Niko Bellic is presented as a former criminal with a violent past who has come to America to start a new life sans killing and crime. Yet nearly every single mission has him committing a crime and killing people, all the while shouting aggressive obscenities at his opponents only to moments later, continue saying how he doesn’t want to kill anyone. This is not the case in Tomb Raider. We are presented with a young Lara, inexperienced in both killing and raiding tombs. Over the course the narrative, Lara evolves into an aggressive, skilled survivor who will do whatever it takes to protect the people she cares about and herself. The gameplay feeds directly into this evolution by locking away more aggressive kills behind tiered progression. As the story and game unfolds, the game offers players these new skill sets directly in step with Lara’s narrative arc. The moments following this shot will change Lara forever. The an old adage in film is “Show, don’t tell.” A good visual storyteller tells us exactly what we need to know for the story they are telling. The audience can fill in the gaps. When we first meet Indiana Jones, he pulls out his whip and snaps a gun out of a would-be attacker’s hand. We never needed to know how and when he learned to use a whip, we now know that he does and we can move on. Another aspect the game handles deftly, and perhaps a bit too subtly, is Lara’s prowess with a firearm. It seems that there is a misconception that because Lara has never killed before, it must mean that she’s never fired a gun. Jokes and asides have been made about how Lara is an expert shot despite the fact that she’s never killed anyone. It would have been easy for Crystal Dynamics to merely ask the player to accept it and get on with the killin’ like so many games do. What Crystal Dynamics manages to do extremely well is explain so much by showing so little. In a brief in game cinematic – a few moments after Lara’s first kill – Lara finds her handgun is empty. Spying a clip on the ground, she grabs it, loads the clip, releases the slide back in to place and pulls it back and readies the gun to fire. This brief moment gives the player a wealth of information. It tells us immediately that she knows how to handle a gun. It’s easy to extrapolate from this moment that Lara could have very well visited many a gun range and had become a master markswoman. We don’t know the specifics and we don’t need to. The fact that she can handle the gun even on the most fundamental level by inserting a clip and cocking it speaks volumes about the character. Ultimately, Crystal Dynamics asks nothing from the player other than to trust them and enjoy the ride. They employ tactics that great filmmakers have used for over a century to tell the story of a girl who faces death at every corner and emerges a survivor. And for that, I thank them.